Watching her on the balcony when Kylo was on the bridge with Han, you really do get the sense that she truly expected Kylo to go home with them. I think that her reaction in the snow is a continuation of the betrayal that she feels she's experienced from someone that she expected better from. @ISeeAnIsland he definitely realizes after Chewie shoots him that she saw the whole thing, so following has to partially be "Let me explain" and she's like "F___ no, I'm done with you." Yes, I can see her chin kind of scrunched up and trembling, like she's fighting tears. Kylo looks like a homeless puppy, with that stark loneliness and need displayed on his face. This guy just kills me. @Slade - I've read the comment that he looks like a puppy left behind at home when she runs off after Finn, so it's there. But yeah, it's a split second move of her chin/lower lip where her instinct is to cry and then she hardens it. Not just that she's angry/disgusted because of what he did to Han but also because of what she saw in him, that she feels personally betrayed by his actions. And then getting angry enough to shoot him. 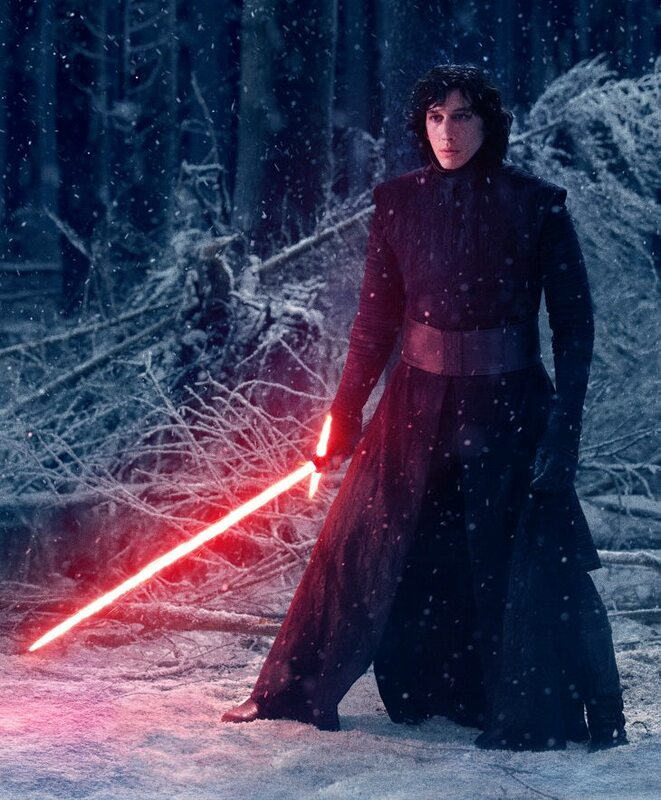 And that's another thing too many people gloss over: Kylo is not brandishing his saber at this point; it's at his side. He isn't charging at them and he isn't really close to them. She shoots first. Somehow the antis don't question the morality of that (or the morality of Finn killing multiple of the troopers he has grown up with, apparently without a single care). Not just antis, GA too. Humans have a tendency to put people in boxes. Kylo is designated baddie so it's okay if Rey shoots at him, but if he Force pushes her into (oh no, not this again!) a tree in self-defense, we discount that he is injured and probably not on his A-game because, again, designated baddie. My mom is a passing SW fan and can be considered GA. We have literally had this conversation at least 5 times. She misread Rey slashing Kylo's face while he was unarmed as a natural reaction out of fear. Um, no. LOL. But Rey is the good guy with the blue saber right? No matter what she does, it must be okay. Just people being people, putting other people in boxes. Rey's very much a shoot first, ask questions later given the neighborhood she grew up in. But that response of trying to shoot him is very very personal on her behalf, same as slashing his face. The practicalities of the situation (getting out of there, not giving him the map) aren't probably on her mind when she pulls the blaster on him, she wants to hurt him for what he just did to her. @MeadowofAshes wrote: Not just antis, GA too. Humans have a tendency to put people in boxes. Kylo is designated baddie so it's okay if Rey shoots at him, but if he Force pushes her into (oh no, not this again!) a tree in self-defense, we discount that he is injured and probably not on his A-game because, again, designated baddie. My mom is a passing SW fan and can be considered GA. We have literally had this conversation at least 5 times. She misread Rey slashing Kylo's face while he was unarmed as a natural reaction out of fear. Um, no. LOL. But Rey is the good guy with the blue saber right? No matter what she does, it must be okay. Just people being people, putting other people in boxes. Not to mention that it is easy to use excessive force when you are in a hyperadrenalized, fight or flight state and badly injured. It is not irrational to think he may not have intended to throw her with as much force as he actually did. [size=38]I always thought that there might have been a chance he was trying to freeze her and he was just totally off his game because he's so upset that his brain would be on fire. Is there a reaction shot of him when he does this? Do you mean this? He actually looks rather concerned here, IMO. I think the script says he was having trouble with the Force so it's possible he wasn't trying to throw her into that tree at all. I saw a film clip of that scene from a different camera, and what it revealed that you can't see in the movie is that after he threw Rey and knocked Finn down, he immediately turned away from Finn (as shown in movie) and appeared to be walking towards Rey, perhaps intending to check on her. Notice that in the movie when Finn ran to Rey to check on her, Kylo basically held back and let him do so. Kylo just stood and watched for a good while before re-engaging Finn. He possibly was waiting to see how Finn reacted in order to gauge how Rey was. That is a stunning reaction shot. He looks quite concerned. What is up with that crazy wide stance he's in? I don't know about the super wide stance (I like the dominance it conveys though ) but as far as not going to check on her himself... continuity. If they have a Force bond/mental connection, he'd be able to know she was okay, no? @MeadowofAshes wrote: I don't know about the super wide stance (I like the dominance it conveys though ) but as far as not going to check on her himself... continuity. If they have a Force bond/mental connection, he'd be able to know she was okay, no? Here's that part of the script too. 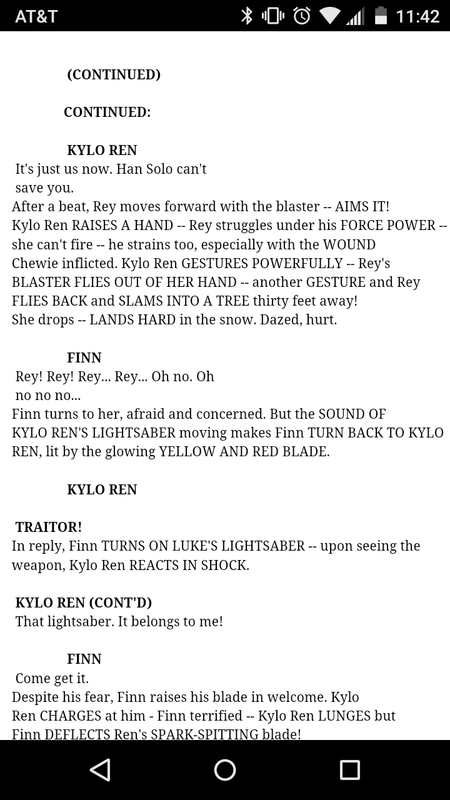 @meadowofashes Interesting that it's Kylo who charges at Finn in the script. It's funny that Finn says, "Come get it," but then it's he who charges. He doesn't even wait to give Kylo a chance to come get the lightsaber! Lol. The actions don't really line up with the dialogue which makes me think they made some last-minute changes while filming. I love the photo of Adam you are using for your avatar! And yes, it was a good change to have Finn charge Kylo because it kind of became an important moment for Finn in that he stopped running away and ran headlong towards someone who terrified him. @Slade wrote: I love the photo of Adam you are using for your avatar! And yes, it was a good change to have Finn charge Kylo because it kind of became an important moment for Finn in that he stopped running away and ran headlong towards someone who terrified him. Yeah, Finn has changed a lot since the beginning of the film. He's still terrified of the First Order but will confront and fight them to save his friend. I think he'll be a huge asset to the Resistance come Episode VIII. @Reynak wrote: I agree, I think she looks concerned, there's guit at having to leave him to his death there, wounded and abandoned. She is not the kind of person who would leave anyone like that if she had the choice. There is a very ambiguous scene in ASoIaF novels where a girl, Arya, leaves a man grievously wounded but refuses to off him as he pleads. She refuses to give him the gift or mercy although she hates him because he killed a friend of hers. By then she knows that he, the Hound, isn't as monster like she had thought. So she leaves him but doesn't kill him and goes away after saying he deserves suffering. Rey also had the chance to deliver a final blow on Kylo and she didn't. Like Arya, Rey knows the wounded broken man is a killer but she is no longer sure he is a monster and deserves death. In fact she knows he is a sinner but not a monster. I think she would have helped him if she had been able to because she is not the kind of person who abandons anyone who is helpless, not even those who don't deserve help and I'm not sure she hasn't realised he deserves more pity than hatred after she saw in him through the Force. Hey, I know it's been A LONG time since anyone has posted in this thread, and I'm sure this has been discussed elsewhere (I did look around a little before coming to this thread), BUT does anyone know if Ben says "Rey" as he struggles to sit up right before the earth splits between them? Or is he just grunting and it sounds like Rey? I've seen people say both, but I wasn't sure if there ever was conclusive evidence. I can't find any closed captioning clips of it to confirm it for myself, but I have been curious about this. It looks to me that he is trying to say something and hold her attention, but again, maybe I'm way off. We did an "experiment" with this a while back where we listened for this. Most of us could hear a distinguishable, audible "Rey" if we watched the scene on a laptop/tablet with decent headphones. (I certainly could.) Without the headphones, it just sounded like a groaning to me (and a few others, I believe). Same here with noise cancelling headphones. It sounded like just moaning in the theater (and that whole sequence goes by so fast anyways), but with headphones it's there. Same with how there's another part in the fight where his mouth is moving, but whatever he was saying to her got taken out of the sound edit. They're there but at some point the decision was made to either mute or remove those lines from the audio track. But with the headphones, he pretty clearly says/moans her name two times when he's trying to pull himself up off the ground to look at her. It's the beat right before the ground opens, so maybe in response to her standing there debating about whether or not to finish him off? I'm struck by how her demeanor changes just after the ground splits and separates them. Her face loses the look of fury and her expression seems to show shock and horror - a kind of'what have I done' look. She also looks back before fleeing Starkiller on the Falcon; in the junior comic she's actually watching Kylo being rescued. It's as if once her anger has calmed she feels disturbed by what she's done to him. Which makes one wonder....what will her reaction be when she sees what she's done to his face?